Buy a 12 pack of Gold Label Sampler toros and get a free lighter & cutter! 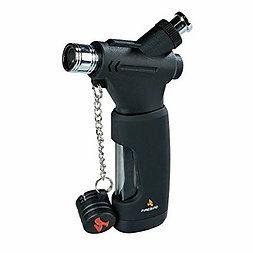 Colibri Firebird Lighter: This single jet flame lighter features a single action ignition, an easy to use flame adjustor, and a large fuel tank and fuel viewing window. The attractive design is coated with a rubberized body for a comfortable grip and also comes equipped with a protective cap for safe keeping. Credo Xxl 70 Ring Black Cutter: Gets the job done that the other cutters can't. This one is for the big dogs - you can cut up to a 70 ring gauge cigar with this bad boy. This big ring gauge cutter is constructed with stainless steel blades.